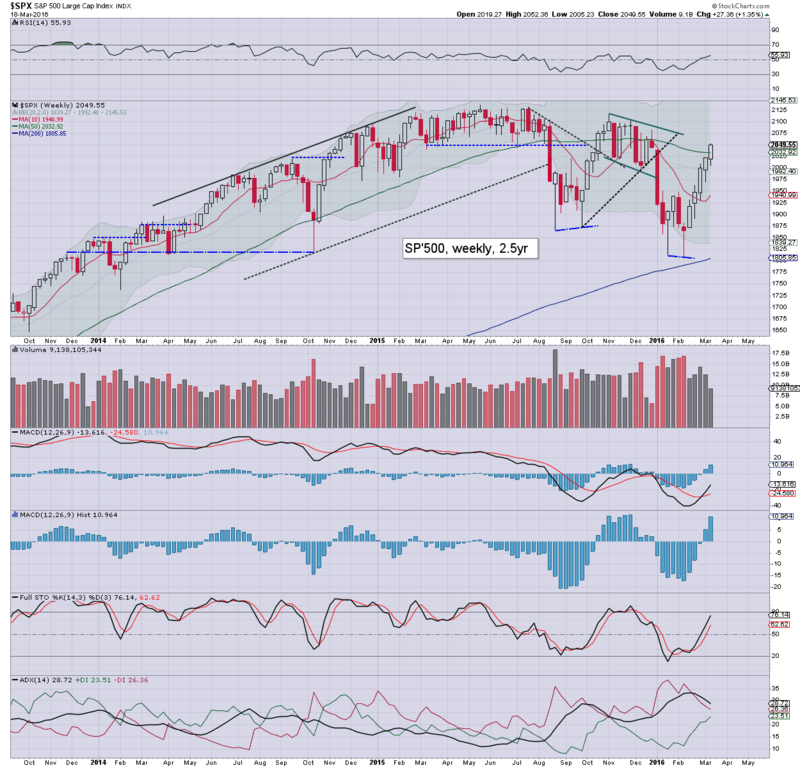 It was another bullish week for US equity indexes, with net weekly gains ranging from 5.0% (Trans), 1.3% (sp'500, R2K), to 1.0% (Nasdaq comp'). Near term outlook threatens WTIC Oil in the $44/45s, and that will probably equate to sp'2070/80, before cooling into end month. The broader bearish outlook is... borderline intact. 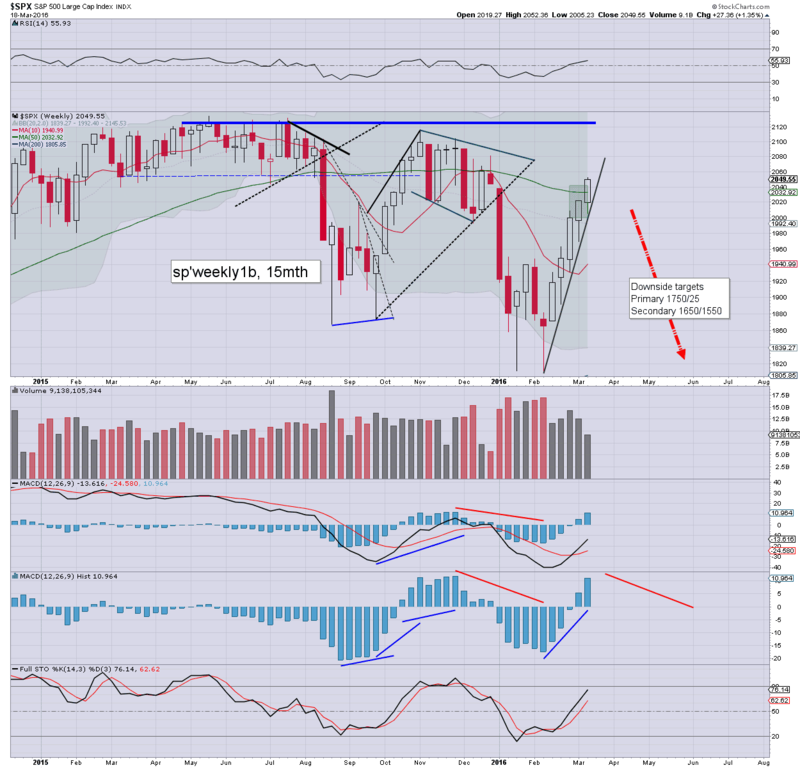 A net weekly gain of 27pts (1.3%), with a new cycle high of 2052. 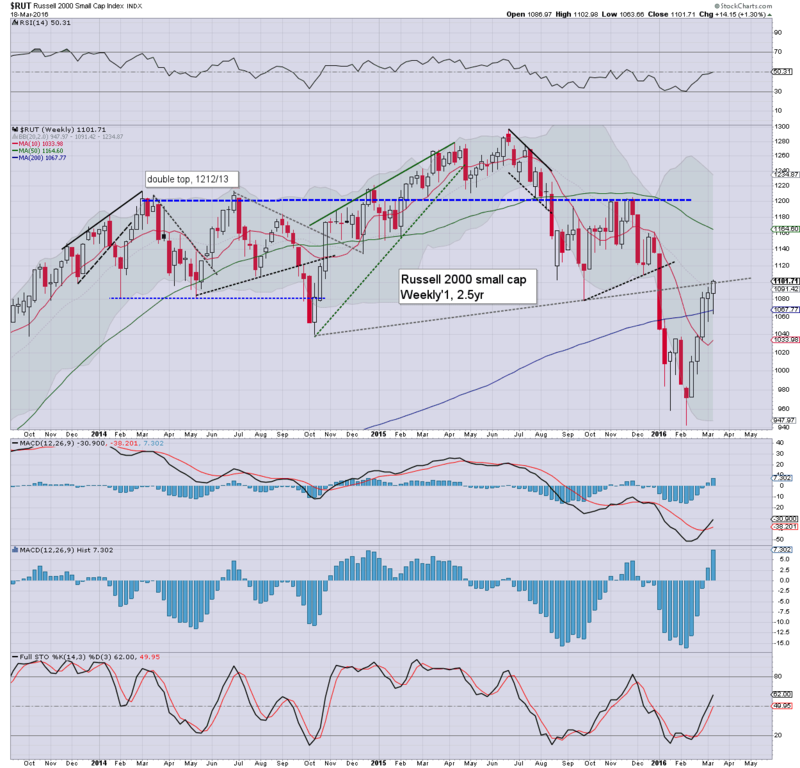 It is notable that the key price gap of 2038/43 has been filled, next resistance is the 2070/80 zone. Underlying MACD (blue bar histogram) cycle ticked higher for a fifth week, and is now on the high side. 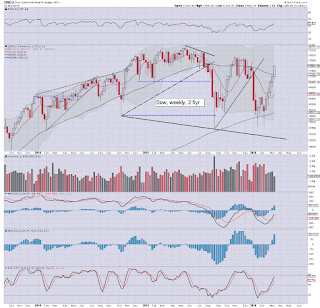 Even if the market maxes out next week, it will likely be another four weeks before the next bearish cross. Best guess: further upside to the 2070/80 zone, with no daily closes above the late Dec'2015 high of 2081. 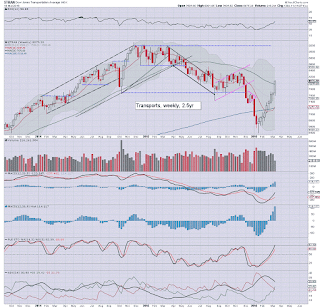 First soft downside target before end month is the 1950/40 zone. 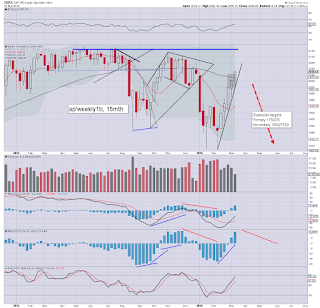 A break of the Feb'11th low of 1810 looks possible in late April, but more viable in May. The tech was the laggard this week, with a net gain of 47pts (1.0%) at 4795. Next key resistance is the 4900 threshold. As things are, sustained action above the giant 5K threshold still looks out of range until Q4 at the earliest. 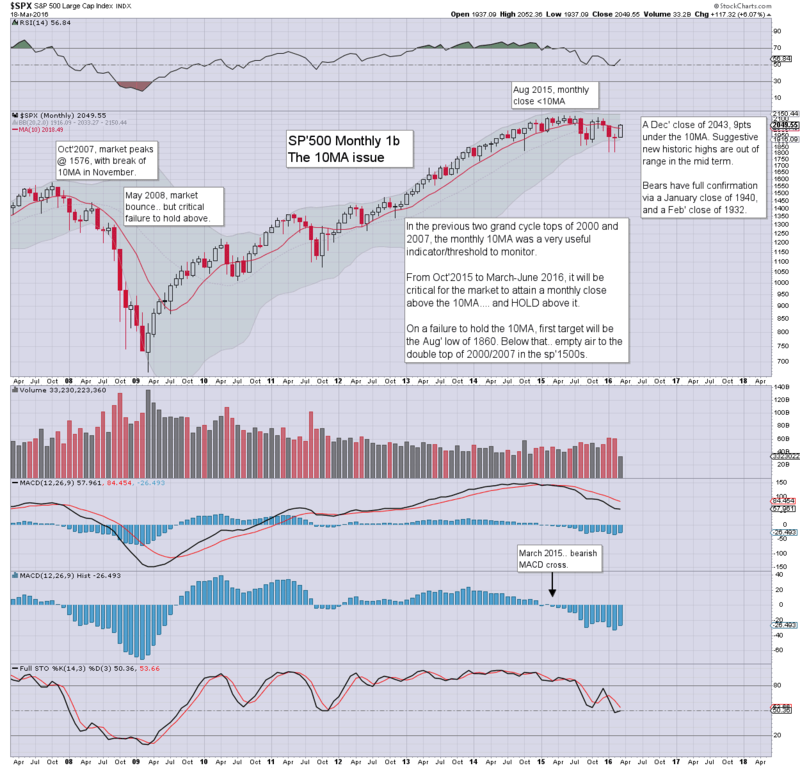 Clearly, any monthly close >5K will absolutely negate the broader bearish outlook for this year. The mighty Dow gained 388pts (2.3%) @ 17602, the highest level since late Dec'2015. Next resistance is the 17800/18000 zone. Any daily closes >18K would entirely negate the current bearish outlook. 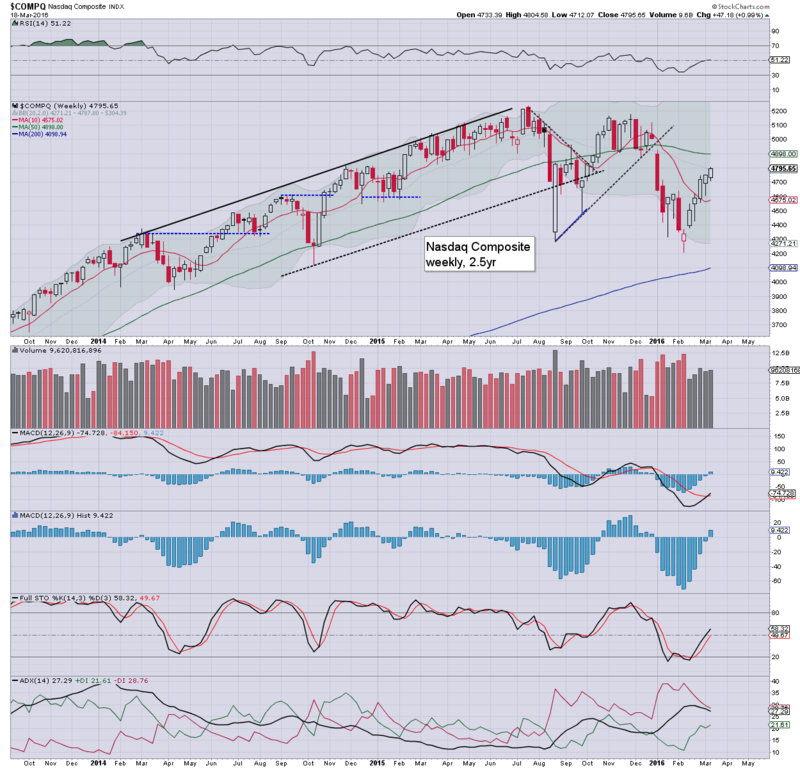 The master index saw a net gain of 1.2% in the 10200s. 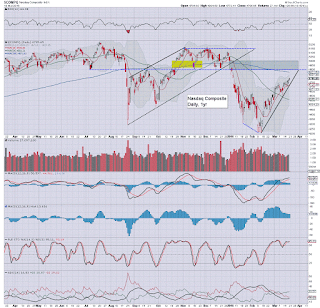 Next resistance is the 10400/500 zone. Any price action much above 10700, would bode powerfully in favour of the equity bulls. 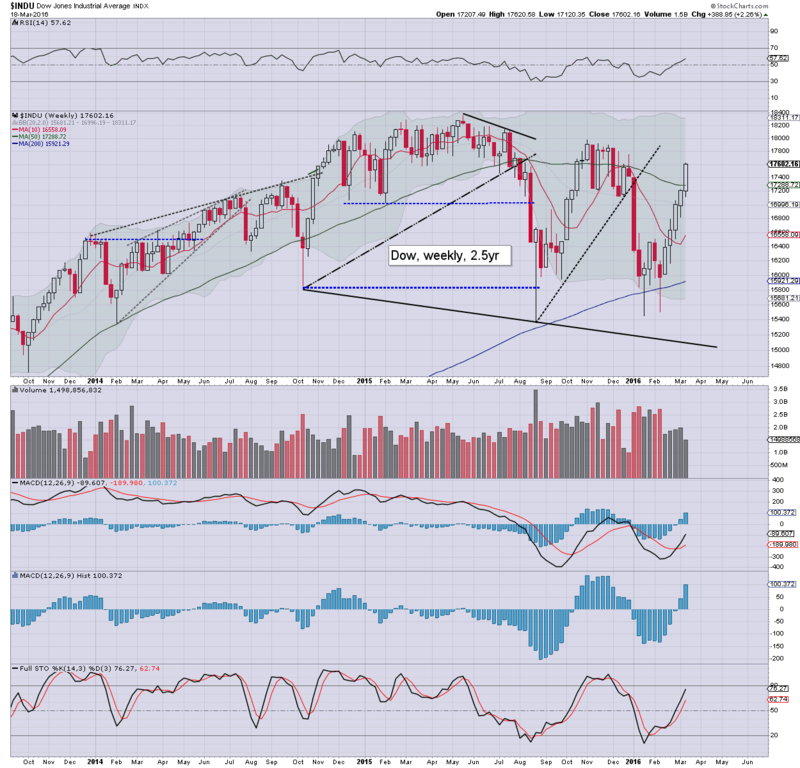 The second market leader - R2K, climbed for a fifth week, settling +1.3% @ 1101. 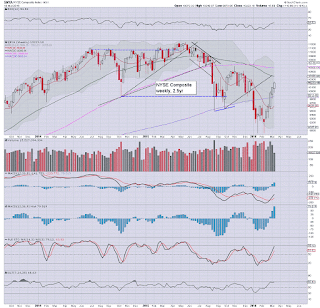 Next key resistance is the 1150/60 zone.. where the 200dma is lurking. 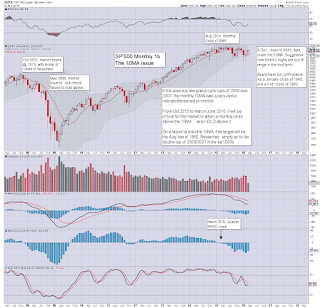 The 'old leader' - Trans, climbed for a ninth consecutive week, +5.0% @ 8075 - equaling the run of March-May 2009. 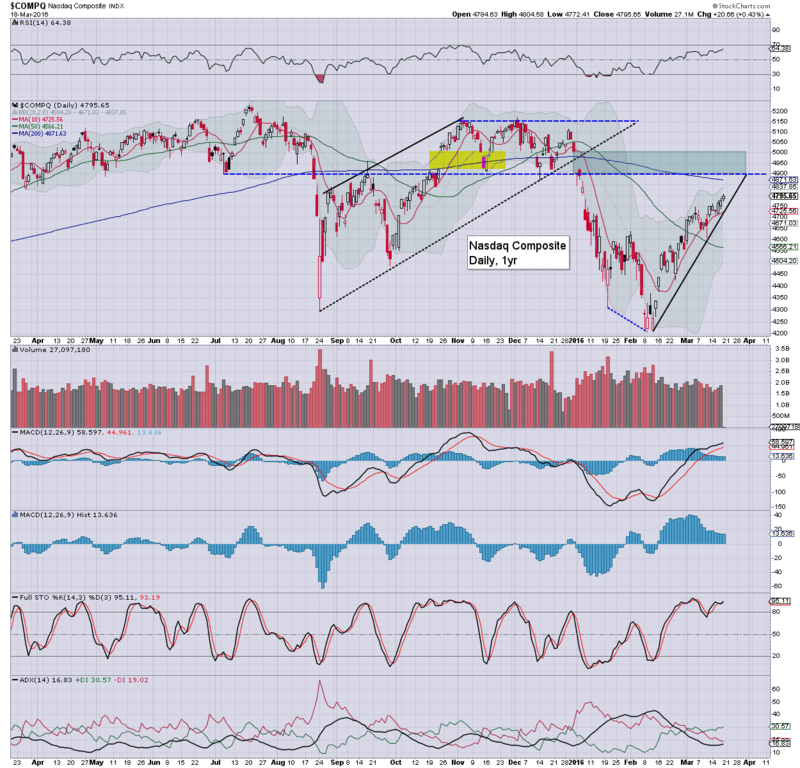 Next resistance are the 8400/500s. The equity bulls are seeing yet another powerful rally. Indeed, the current up wave is very similar to that seen last Sept-Nov'2015. 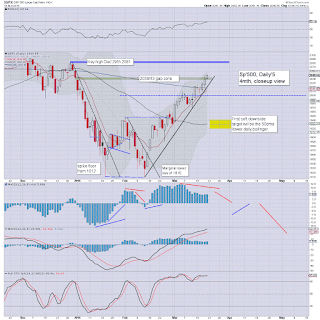 The late Dec'2015 high of sp'2081 is pretty important. 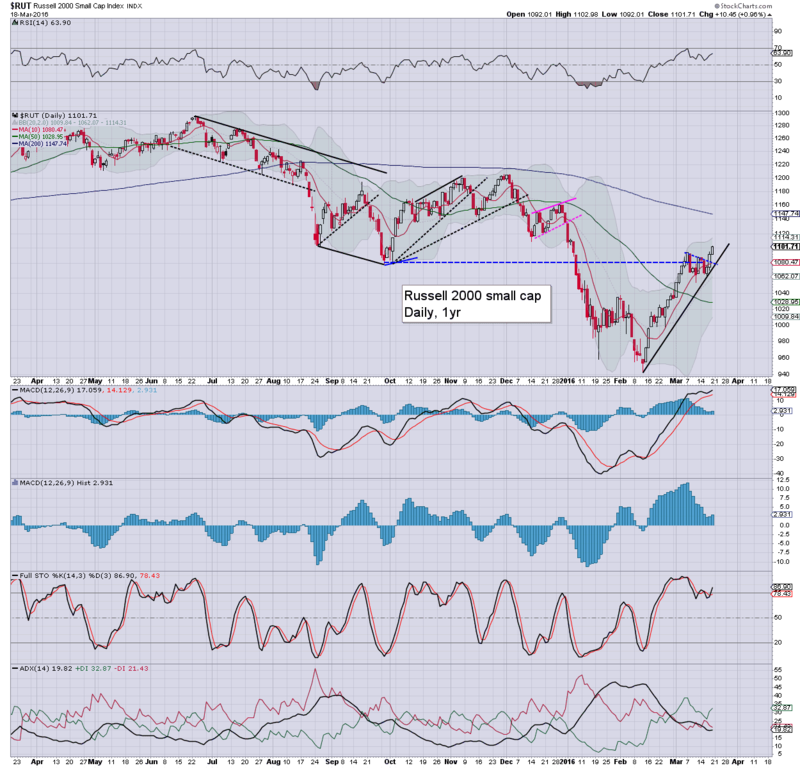 As many would agree, the market rally since Feb'11th has primarily been inspired via a hyper ramp in Oil prices, with WTIC swinging from the $26s to the $40s. If Oil becomes stuck around $45 before end month, and then starts to cool (as the over supply issue remains entirely unresolved), the broader equity market will likely be dragged back lower. It will be a shortened holiday week, as the US (and almost all other world markets) will be closed for 'Good Friday'. F - CLOSED, however GDP (rev'2) and Corp' profits data will still be published. *there are a sprinkling of Fed officials, notably, Bullard late Monday and Thursday. With US equities managing a fifth consecutive week of gains, sp +27pts (1.3%) @ 2049, the equity bears have largely already been short-stopped out of their positions, with many bears having turned bullish. 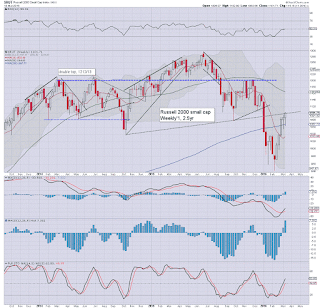 As ever, the monthly close will be very important, with just 8 trading days left of March. For those currently holding short, this is clearly an increasingly stressful and difficult time. Yours truly has managed to have had the patience to side-step this latest nonsense, and I remain seeking an 'ideal' short market entry. 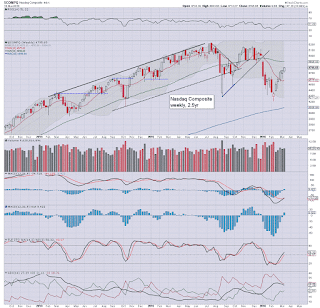 US equity indexes closed moderately higher, sp +8pts @ 2049 (intra high 2052). The two leaders - Trans/R2K, settled higher by 1.4% and 1.0% respectively. 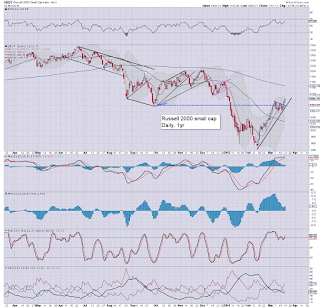 Near term outlook threatens further Oil upside to the $44/45s, and that might equate to the sp'2070/80 zone, before next opportunity of a rollover. 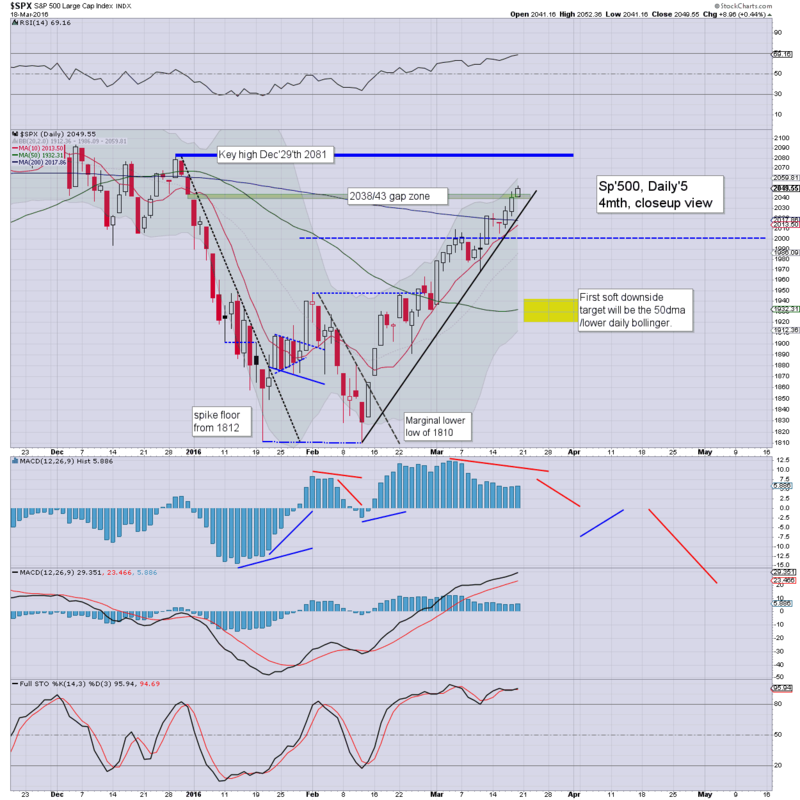 sp'500 - having cleared the gap zone of 2038/43, and soft resistance of 2050, next level is the 2070/80 zone. 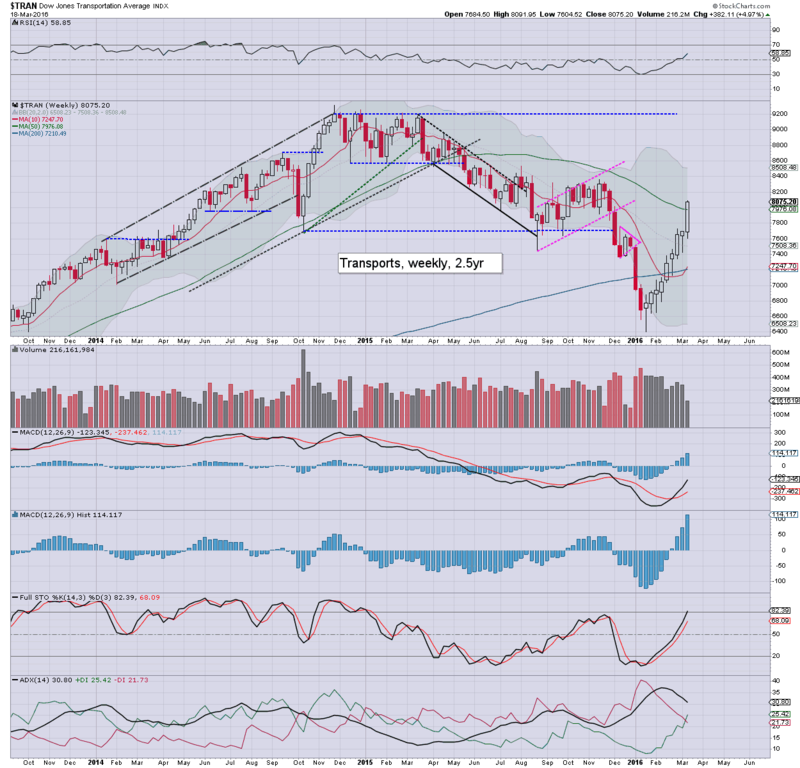 Nasdaq - a clear gap from early Jan', around the 4900 threshold. 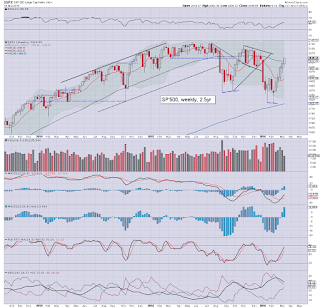 R2K, a new cycle high of 1102, with a notable weekly close above the 1100 threshold. 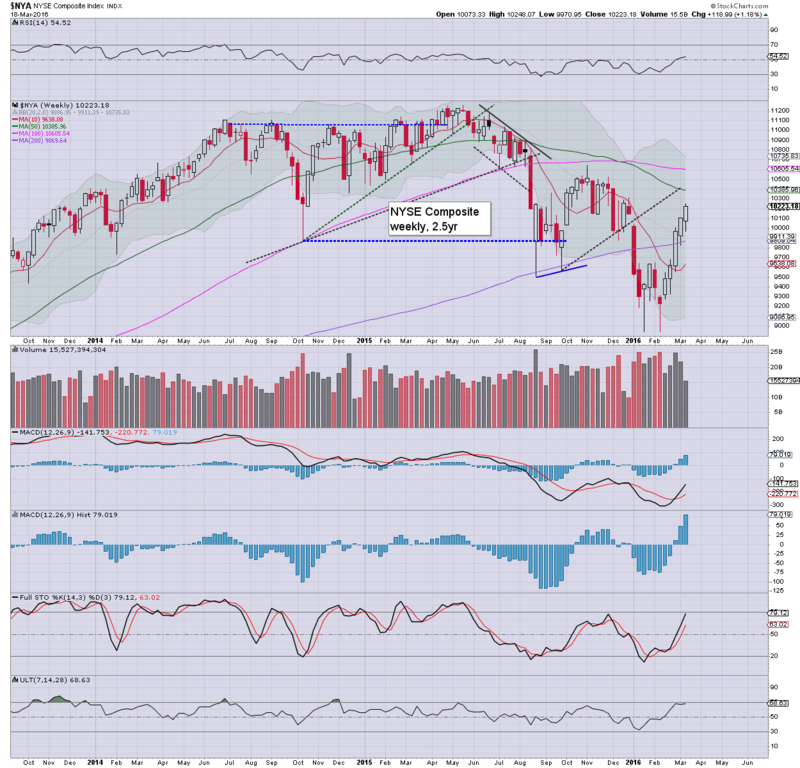 Next resistance is arguably not until the 200dma in the 1140s.